I’m not going to say it’s the top reason I live here, but one of the main reasons that I live in France is because of the cheese. It’s not just that I like cheese – which I do very dearly – but it also represents something that France has held on to, and still defies modernization. You just can’t make Comté or Bleu de Termignon with a machine. 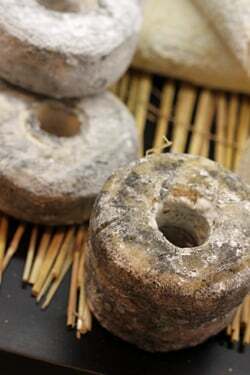 Each is made in a certain region, with milk from certain pastures, then molded and ripened, then sent to a skilled fromager to be offered to customers. My dream job used to be to work in a cheese shop, until a friend who worked in a cheese shop told me how hard it was. (As those of you who read my Paris book know, I found working at the fish market quite different than I initially thought, too.) But no matter what people say, the idea of being surrounded by cheese in every direction, learning about the different regions and styles of cheesemaking, and just inhaling the funky, pungent aromas also sounds like heaven to me. If you go into a French supermarket, there are plenty of cheeses to choose from. But traditional fromageries survive in Paris because of the personal service one gets. Not every neighborhood is lucky enough to have a good fromagerie close by, but there are a good number scattered around Paris, and every outdoor market has a cheese merchant, lording over large tables covered with straw mats, with rounds, triangles, crottins, and slabs of cheese from across France. When he said “here” he was referring to one of his cheese shops, part of the Pascal Beillevaire group of fromageries, which are mainly clustered in Loire-Atlantique region of France (toward the west coast), with a few in Paris. Jérôme owns three of them in Paris, and we made arrangements for a visit to his shop up in Belleville. A visit to a cheese shop can be a daunting experience. But it’s one I never get tired of. You often don’t know what to expect, as many cheeses are seasonal and a good cheese shop will only carry what’s best at the moment. Although people do buy cheese at the supermarket, I like the one-on-one discussion with the vendor, who will verbally joust with you, until they find the right cheese for you that day. I often hope there’s a line because it gives me a chance to see what others are ordering because most shops and I like to overhear the discussions they have about what cheeses they bought a few days before, and how they liked them, and what’s best at the moment. Beillevaire is a little overwhelming since they have a lot of cheeses that I’ve never seen before, like the doughnut-shaped, moldy Courounne-Lochoise raw milk goat cheeses from the Loire. Each one has a history and tradition attached to it, and Jérôme and the other fellow in the shop, spent the better part of the afternoon tasting our way around the shelves. I’m not necessarily a fan of “flavored” cheeses, preferring the milky taste of the cheese itself, but when I tasted the Gouda with orties (stinging nettles), it had the faint green-grassiness of wild plants, with a touch of mint. Not French, but a completely different cheese than the industrial Goudas that one normally finds. Brittany is one of the few regions in France not known for cheesemaking, except for the industrial giants, who have their cheese factories there). So I was surprised to see four musty plugs lined up, called Menez Hom, from the Finistère part of Brittany, on the extreme western tip of France. The rule about eating the crust of the cheese is that if it won’t adversely affect the flavor, the crust is edible. And in spite of the fact that some people scoff if you don’t eat a particularly funky crust, in France, I’ve seen people leave behind crust that I thought was perfectly edible. So it’s a personal choice. And when my eyes took me to a particularly, um, colorful cheese, they insisted I try the crust. And I was glad I did, since it was viciously mottled, but the taste was earthy and delicious when eaten with the creamy pâte inside. 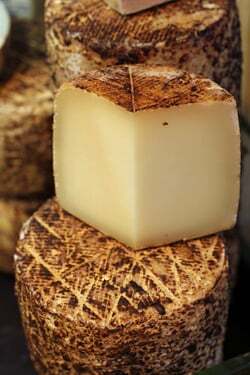 Tomme Brûlée is a smoked sheep’s milk cheese from the Pyrenées which gets it’s croûte (crust) because people used to store their cheese in the chimney, to preserve them, which also gave them a smoky flavor. 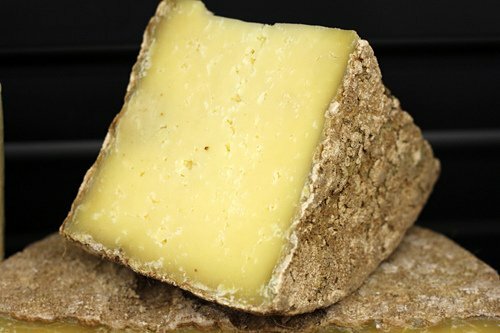 Nowadays there’s a number of cheeses from that region that are smoked which I like a lot, but I’m not sure I would eat the rind on this one. But like wine, there’s not a whole bunch of rules that you really need to follow; the most important thing about eating cheese – or anything, really – is just to enjoy it, man up, and not worry about what other people say you should do. Saint-Nectaire is a cheese I’ve never fully appreciated except on the one occasion when I had a memorable one. 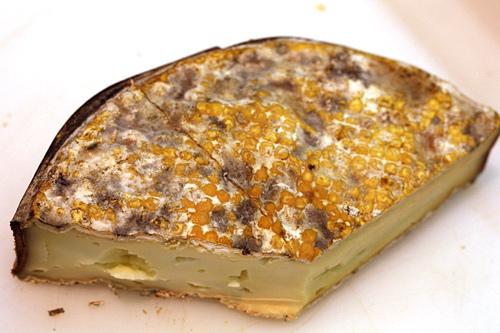 But French friends go wild over Saint-Nectaire, exclaiming that is has the taste of the terroir (regionality). But normally I always shrugged my shoulders, and found it rubbery and bland. I’ve since decided that it was a cultural difference and that perhaps there was something about the French that they could perceive different flavors in cheese than people from elsewhere. However if you’ve had an experience with one, I’d be interested in hearing about it in the comments. But, ah, the butter. A number of years ago I first tasted their incredible butter, which is so good, you don’t want to even put bread under it. There’s unsalted, salted, and demi-sel croquant (crunchy) à la fleur de sel de Noirmoutier. Pardon my French, but holy sh*t, that butter is good! Made from raw milk, it’s not as dark as other butters, likely because of what the cows eat, but has a fresh, uncomplicated taste of dairy. 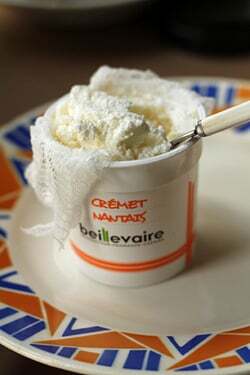 It’s so good, I lick it right off the knife after spreading it on a crunchy baguette, if no one is looking, of course. After I made a few purchases, Jérôme asked me if I liked pain d’épices, which he must have noted because I kept glancing at the oversized slabs, which he told me was his father’s secret recipe. I tried quizzing him repeatedly, but he waved me off with a laugh..and a nice slice in my shopping bag. There was also a superb rice pudding in a jar, with a puddle of caramel waiting in the bottom, which was so good that I kept dragging my spoon through until I threatened to break the thick glass bottom. 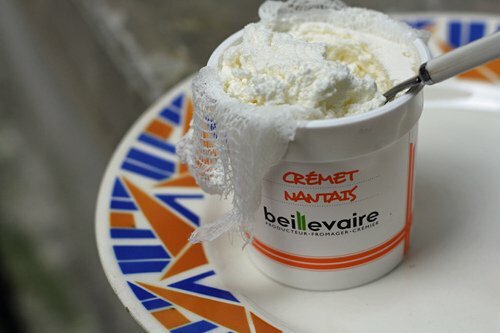 And a little tub of Crèmet Nantais, which turned out to be very fresh whipped cream that had been left to drain, which thickened it up. It was slightly creamy at the bottom, with crumbly chunks of high-butterfat cream on top. 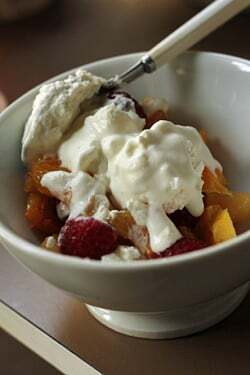 I heaped it over fresh pineapple and berries, which could not have been a better dessert. As you can imagine, I was busy tasting, talking, and taking a few pictures and didn’t jot down each and every type of cheese shown here. However if you come to France, instead of arriving with a fixed idea of which particular cheeses to try – because many of them are seasonal and regional, it’s likely that exactly what you want may not be available. Like many things in France, if you go shopping with a preconceived notion of what you’re going to buy, you’re often going to be disappointed. One day you’ll cut into a tiny, soft disk of Rocamadour, that will make you swear off any other cheese. 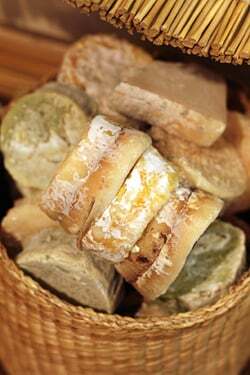 Then the next time you go in search of another, perhaps at a different fromagerie or from another producer, you’ll take a bite and you’ll pine for the other. Much of the flavor and quality of any cheese depends on how the cheese was made, and who made it. And the last step, which is just as important as the making of the cheese, is how the cheese is treated and ripened in the shop where it’s purchased. So it’s best to go to a good fromagerie in whatever neighborhood you’re in, let them know what you like, then try them for yourself. And if you’re happy, go back the next day and thank them. (And if you’re not, chalk it up to a learning experience.) Trust me, you’ll be fondly remembered. As was this Camembert…for the short time it lasted. 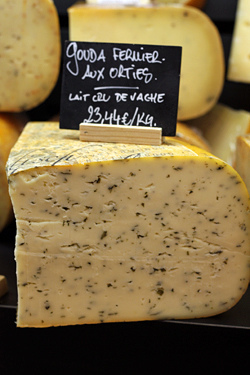 Jérôme is also the owner of the Pascal Beillevaire cheese shop at 215, rue Faubourg-St. Martin (10th.) Other Beillevaire shops in Paris are owned by the parent company. Ooooh – you make me want to get on a PLANE right NOW just for the cheese! 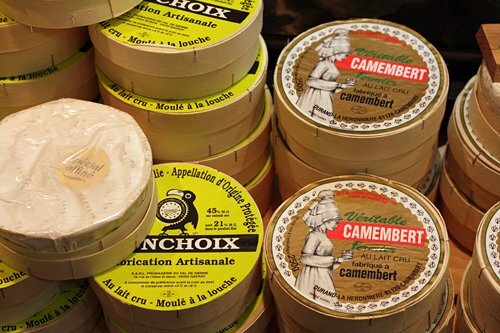 My all-time fave is Vacherin Mont D’or………..I keep trying to get someone to smuggle one home for me but they SAY they get it and just eat it before they manage to get on the plane home! The 14 year old said he’d be interested in “checking out Paris” and all I could think of was “CHEESE”!!!!! Thanks for making my mouth water this morning! What a heavenly post. Even though it’s 8:30 in the morning in CA, I am craving all those lovely cheeses…thanks so much for that. Tell me again, how do you stay so thin ???????? P.S. How’s the kitchen coming along? I am drooling all over my keyboard! Cheese attracts me far more than even ice-cream! When I lived in Paris, there was a lovely fromagerie in the rue du Babylone, just round the corner from me – sadly, I could seldom afford to patronise it! But it was lovely…. I wonder if it is still there. Along with the bread, cheese is one of the things that makes me the happiest living here in France. I try to tell people about the butter too but it’s something you have to experience to fully appreciate. I will be sad when the day comes when we move back to the states since French cheese, bread and butter have become a way of life for us. While travelling in France a number of years ago, we fell in love with a cheese flavored with walnuts/walnut oil. We can’t remember the name, although know it included noix, which I thought meant nuts in English, but apparently more specifically means walnuts. I’ve tried searching the internet but haven’t been successful. I believe it came from the south of France. Are you familar with this type of cheese? I would very much like to know its name, and then perhaps I can find it in the US or Can–or not! If you were traveling, it might be something that was regional (walnuts are abundant in the Périgord, for example) – I’ve not heard of it, but sounds like something that perhaps a fromagerie might have made? If it was layered, sometimes that’s the case. St. Nectaire is definitely a cheese that is very hit or miss. Over the past four years, I have been a cheesemonger in both San Francisco and Brooklyn, and I have seen all variations of quality of this wonderful French cheese. Many, as you said, are bland, rubbery, and totally forgettable. 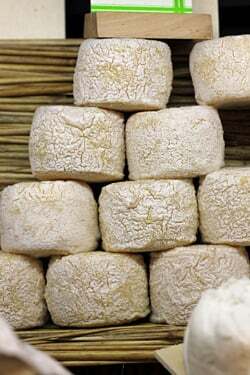 But, if you manage to find a St. Nectaire that is at its peak, it is a wonderful experience – the cows graze on lush grasses growing in the volcanic soil of the Auvergne, and the flavor that these pastures impart is simply amazing. St. Nectaire should be slightly creamy, but not spreadable, and should have flavors of earth, grass, mushrooms, nuts, and herbs with an aroma of both damp cellar walls and a pile of wet leaves. 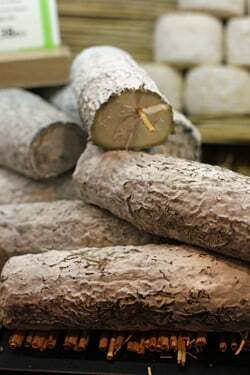 The remarkable thing about St. Nectaire is that there are no other cheeses that taste like it, as it is truly a product of the unique flora and fauna found in the Auvergne and follows AOC rules of production. But, like all cheeses, everything can go totally wrong in the aging process, and if the cheese has been sitting around the store for too long it’ll lose it’s special spark. Even though I work at a shop in Brooklyn, we carry an excellent St. Nectaire that will knock your socks off. If you are ever in the neighborhood, please stop by the Bedford Cheese Shop! What a beautiful description of what St Nectaire should taste like… It reminds me of the lovely vistas, green, fertile with small volcanic hills dotting the farmland grander peaks surrounding the distance and small church spires piercing the sky. My family is from Auvergne and I have visited the town of St Nectaire. A good wheel of it is stuff made of legends in my family, but it us possible that he rubbery ones people speak of are stale. When it is in its perfect state, it is divine. While living in Germany I became slightly obsessed with stinging nettle cheese. 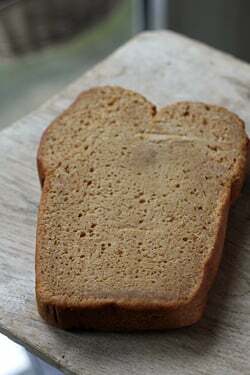 I believe it is quite popular there and now living away from Germany, I frequently find myself longing for a sandwich on black bread with butter and nettle cheese (my favorite take along snack). Your photo renewed my craving. Ohh I can’t wait for cheese this summer. Despite having eaten more than I could ever keep track of, I am notoriously bad at knowing the names of cheeses. It gets pulled out at the end of every meal with our friends, and we eat whatever it is that they have at that moment. Always a bleu, a hard and a goat of some sort, but it varies all the time. There was one bleu which has stayed in my memory, nothing has ever been so good. Alas, I can’t remember which stall holder we got it from or even which market, so the search to find it again has now gone on for years! Note to self, must write down the names! It’ll never happen though, and I’ll forever be haunted by irretrievable delicious cheeses. This post is about what heaven must be like. I remember on a trip to Paris we would stop at a fromagerie daily and buy several cheeses, a bottle of champagne, and a baguette, sit in the first available spot and have lunch. Some of the best and most memorable meals of my life. Melancholy is setting in. Hi David! I just returned from Paris yesterday and visited about 4 or 5 fromageries. One of your blog posts recommends Chez Virginie, and it was my favorite shop. The woman working there picked out a fabulous goat cheese for us. We also had a fun experience buying Comte at Barthelemy. I lived in France for a year for school back in 92-93. My mom laughs as I left Canada eating only medium cheddar (sometimes if I was adventurous I would have the white instead of the orange! Or gasp- the marble!). Imagine my mother’s pleasant surprise when my suitcase came home with Brie, Camembert, and a few other surprises- along with a new found love of all types of cheese!!! Wiping the drool offf of my chin…. Je suis une “turophile!” C’est tres stupide que je n’habite pas en France…ou Paris…. Thank you David and Clio13. We were travelling in the Dordogne/Perigord and I believe that was the cheese–it certainly looks as I remember it. If only I could smell it–its smell was wonderful:) The real challenge will be locating it in North America–I suspect I will have to return to France to find it–not a bad idea! Hey merci, c’est une découverte pour moi. J’ai dû passer dix fois devant sans faire attention. Of the many things there are to miss about France . . . I miss most the cheese shop and the heady eau de cheese that envelopes you when you open the door. David, I’ve been in heaven for nearly two weeks thanks to your recommendations. One of the first things I bought was the beurre cru baratté à l’ancienne on rue St Antoine, then the 30-month old Comte at Marché de Montorgueil. I also read “Sweet Life” while we were here. Merci, merci, merci. You’re the best. My husband and I have been trying, without success, to find a Tomme we had as part of a dinner party cheese course umpteen years ago. We asked at the time and they said only “Tomme” so any suggestions you might offer would be gratefully received. All the ones we have tried are good, but they are normal Tomme and not as fantastic as this one was. Are there some that are aged longer? Your Tomme Brûlée reminded me of our search. I don’t think ours was smoked though. Oh my goodness – it’s amazing you should mention Beillevaire! 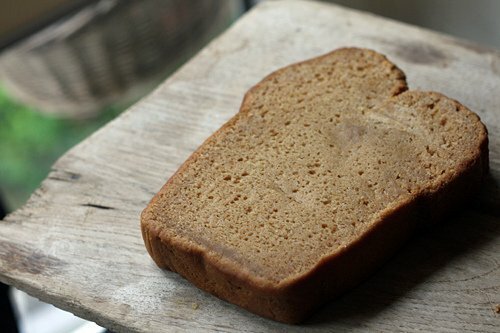 I have just recently come across the butter – demi sel (look, there’s a picture to prove:): http://bit.ly/J7IH3T) – and had the very same thought: boy, was that butter amazing! 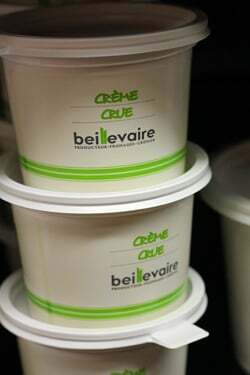 I only wish I could try Beillevaire’s cheeses, too. Maybe one day, since I have already been lucky to discover that butter in London… All the best, David! We are looking forward to a Month in Paris soon..definitely an article to be saved. This will serve as our shopping list at the nearest fromagerie . You make me want to go and bake some sourdough olive bread, buy market radishes and then try to find a cheese worthy of your wonderfully impossible to find descriptions. There is a wonderful book on the history of cheese production in France. “Camembert” by Pierre Boisard. That is an interesting book and I read it many years ago. There’s a lot of history – and myths – about the cheese & while many of the true raw-milk Camemberts are disappearing, it’s nice that there are some (very) good ones that still survive. The one I bought at Beillevaire was amazing. Not only are the descriptions mouth-watering, but the photos! What wonderful descriptions of food nirvana. Thanks! This post could not have come at a better time!!! In just a little over two weeks I’ll be back in Paris and have added this shop to my itinerary!! Thank you David for all the wonderful info on your blog – its been so helpful in planning my trip!! Do stop in! Jérôme’s fromagerie is one of the few cheese shops in Paris that is open throughout the day (most close for lunch). If you’re up in that neighborhood, stop in at Boulangerie 140 just down the street, which is a great bakery. They have a pastry shop around the corner, too! 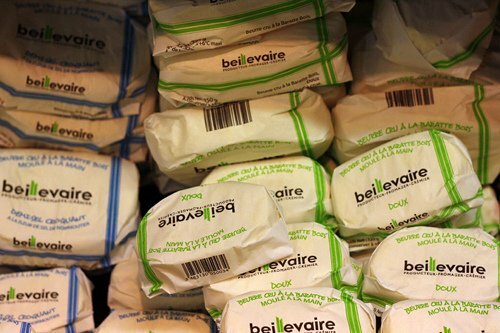 About a year ago I stuffed my suitcase with 4 kilos of frozen Beillevaire butter after a vacation in Europe. Going through Customs Canada back home the customs official asked what dairy I was bringing home. ‘French butter’ I said. ‘Butter?! ?’ he exclaimed. ‘Yes, it’s delicious’ I said, afraid that he was going to confiscate it all. Luckily he shrugged his shoulders (probably thought I was a nut job) and off I went. The butter survived the journey quite well and was still cold when I opened the suitcase some 14 hours after packing it. The rules aren’t clear about what can and can’t be imported and while there’s always a chance that someone might confiscate them, I do bring butter and cheese to friends back in the states. 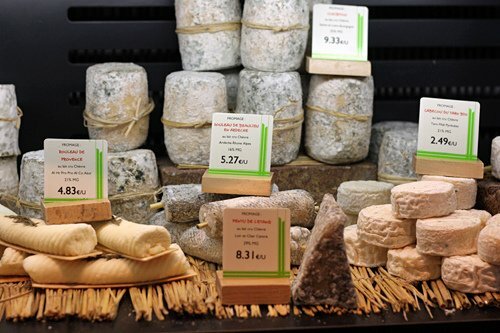 Many cheese shops in Paris will sous vide (shrink wrap) purchases specifically for travel. Holy sh*t, those cheeses look phenomenal. Great post! It’s the first time I’ve seen some of the cheeses you have in your pictures. When you say “skilled fromager” I suppose you mean storekeepers who have a vast and detailed memory of each of their many customers’ preferred cheeses and buying history ( as well as personal data!?) . Quite an ability to have! Gej: Part of the cheese-making process is making sure the people who are selling it store and in some cases, finishing aging it properly. Many cheese shops have caves where cheeses get finished properly (called affineurs), and just like many other products – chocolate, fruits and vegetables, and meat products – you can have the best product in the world, but if the people selling it don’t store or care of it correctly, which in many cases is a skill, it can be ruined. I’m glad wrote about Pascal Beillevaire. I’m lucky enough to have one around the corner from me in the 12th. There butter is the only one I can eat. Once I thought it would be faster to just buy butter at the supermarket but I had to throw it out as it had no flavour. They also make very good yogurt and yogurt drinks. I love the cherry and coconut yogurt. The coconut in summer mixed with fresh peach slices is heavenly. Well after reading about all those different cheese I think I better make a trip there today! That’s a great post with some gorgeous pictures. One thing missing in many small towns nowadays is a fromagerie. The closest one to us in 10 miles away in Selles-sur-Cher. There are good cheese vendors at the local outdoor markets each week, though. But I miss having a cheese shop to browse in. There are good cheeses available in the supermarkets, but it’s not the same experience. Re: Saint-Nectaire, I really want to go to the town and see what the cheese is all about, I had a great experience in nearby Cantal and gained a new respect for what might seem to be an ordinary cheese. i have many, many discoveries to thank you for, with pascal beillevaire’s delicious butter being at the very top of the list. mille mercis ! I just grew weak at the knees. That looks awesome, cheese has always been one of the things that has pulled me to visit France. This post is an eye candy! I love cheese and all of its varieties. I must say that one time I was nearly ready to give up cheese. I was trained as a perfumer–le nez–and for fun, my mentor once asked me to recreate the smell of Brie. One, that was hard. Two, I smelled of dirty socks for days. Some of the materials that I had to use had this ummm… olfactory profile, and they were incredibly strong and tenacious. Well, this little exercise made me appreciate the genius of cheesemakers and mother nature. Oooh cheese, bread and pastry!!! WOO HOO!!! I am set!!! Thanks for the tips David!!! I am lucky enough to live close by this cheese shop .where I buy the KING OF ALL CHEESES as Brillat Savarin named the EPOISSES, also the favourite cheese of Napoleon. I am quite surprised to see that you did not mention it David – perhaps you have not yet discovered it. 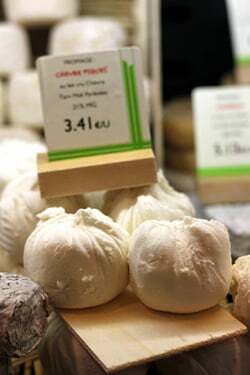 It is a pungent unpasteurized cows-milk cheese -sold in a round wooden box like a camembert. It has a distinctive orange colour all around while the inside is a dream of a yellowish-white creamy soft balanced and subtle bliss with light notes of dry fruits. Do pick the Epoisses made by the BERTHAUT family from the little village of Epoisses in Burgundy qualitymarked as an AOC product. Making the Epoisses is a more complicated process than for other cheese its origins a medieval recipe from a monastery. It does not come cheap. No paradise ever does. Wonderful with dark bread and a young red Côte de Nuits or Beaune even a dry white Bourgogne. . When at the metro station of Jourdain on your way to the fromagerie do discover the glorious Patisserie de l´Eglise on the square by the church. Gorgeous chocolate sorbet and home of the best millefeuille in Paris. An edible piece of art..
Oh, I cannot wait to be back in France!! Beautiful post, I can taste that butter now and all that cheese. I want them all! This post was unbelievably delicious. 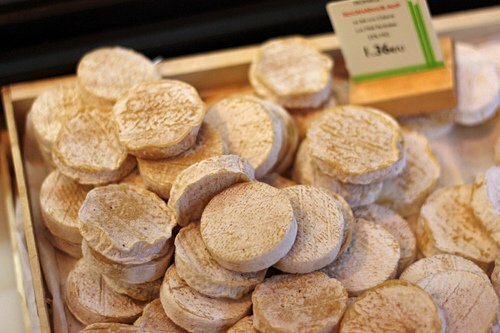 For an excellent St. Nectaire, you must visit the fromagerie of Laurent Dubois, 2 Rue Lourmel 15ême, Métro Commerce ou Bir-Hakeim. My french husband is crazy for St. Nectaire and we happened upon Mr. Dubois’ shop one day. The gentleman is a MOF and firmly counseled against buying St. Nectaire that day, explaining that it would not be worthwhile until some time later (I think he mentioned the month of June or July), because that is when the St. Nectaire made from that past spring’s milk would be “parfaitement affiné”…the rich, yellow spring milk is what makes the best St. Nectaire of the year (because of cool spring rains that grows the richest grasses of the year). We went back later on, spent far too much money, and enjoyed a St. Nectaire that was sublime. You owe it to yourself to stop in there some time. Thank goodness I remembered to include a little Brie on my turkey sandwich otherwise I would not have made it through lunch without running to the nearest cheese shop. Another spendid, and mouth-watering posting! There’s chance I’ll be in Loire come autumn. I’ll put this on my list of places to visit. I love fromageries too. The smell, the sights, the choice. It’s such a pleasure to ask “What’s good?” and let them choose for you. I’ve found some amazing cheeses that way. I would love to know more about why working in a cheese shop is so hard. I don’t doubt it for a minute, but I was craving details in your blog when you mentioned it. Is it the hours? The vast level of knowledge needed on so many types of cheeses (kind of like wine?)? Something else? Would love more info! Other than that, when it comes to expressing my complete infatuation with French cheese, I’m at a loss for the right words. Nothing I can think of to say expresses it quite strongly enough! for this cheese article, I love it. I just bought your book today. Thank you for all of the inspiration! I’m faint with cheese lust. Best blog post ever, by anyone, in the universe. While I adore French cheese, we make some quite spectacular cheese in the U.S. now. By type, I think Vermont artisanal cheese can definitely hold its own against European cheeses. I can imagine that in the next 10 years the American cheese makers will blossom the way the U.S. vineyards have over the last 20 years. I also had the opportunity to meet with Jerome at his lovely shop in Belleville. He is as enthusiastic about Belleville as he is about cheese. He’s a lovely fellow! You are fortunate to live in a place where cheese is still made the way it is and with the purist of ingredients. I don’t think we will ever find that level of expertise and cultural artistry in making cheese in the US. The French have held on to their craft quite well. They also don’t have to contend with Government regulations that regulate raw milk and allow GMOs and corn fed cows. Thanks for the posting. Loved it. Can’t wait to get to Paris next year and pick up on my cheese experience where it left off last time… thanks for the great tips! Have you heard of any cheeses made from holly-fed cows? Loving all of your information on cheese, bistros, Paris, etc. Will be staying for a week this June in an apartment near rue Cler so everything you say will be considered. Thanks for being such a great resource for fellow bloggers. This post has made my day. 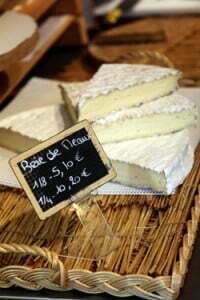 Another reason to stop spending and start saving to go to France, I LOVE CHEESE!! Thanks David for the information. I didn’t know a fromager’s job went to that extent (even the cave…etc. ), finishing cheeses. Though the varieties of cheese are quite limited in our part of the world (not to mention the high prices of imported cheese), cheese is a favorite of each member of the family – the kids were fascinated by the many pictures you showed. Heather, that must have been quite a job at Dean and Deluca! I could die in a vat of cheese and be happy. Seriously. It makes me ache for France when you write about this stuff, but I love it anyway!! Lovely, lovely…every single one of them. “Look…it’s the leaning towa of cheez-za!” What, no one here has seen a Goofy Movie? That’s gotta be my favorite quote. Even though I wouldn’t touch cheez-whiz with a 10-foot pole. I would much prefer a leaning tower of French goat cheese. Yum. Thanks for the great post! Seriously resisting the urge to lick your Camembert of my pc screen. Heaven on a stick. Couldn’t agree more about the Sainte- Nectaire, even a perfectly ripened St Nectaire Fermier from a renowned cheese van in the Caussade market in the Tarn, was disappointing. I was with a very good English chef (not an oxymoron!) who advised me to stear clear as it wouldn’t be worth it however all the locals were buying it in droves so I figured they must know something we didn’t. I think you’re right, must be a refined cultural thing. Nikki, Céline, + Chris: It wasn’t until I had really good St. Nectaire that I understood the appeal. But I do find it interesting that my French friends really discover all sorts of flavors in it, even when we’re eating what I think is a rather bland version of it. I do think it has something to do with a cultural difference, like some people like Vegemite and peanut butter, and others find them not to their liking. Gej: Many cheese shops will have a sign that also says affineur in their description, which describes their role in the final ripening of the cheeses. Some have actual caves in their basement, and some work with the cheesemakers – and visit their caves – regularly, to confer with the people who make the cheeses. intrigued: Since I haven’t worked in a cheese shop, perhaps someone else can chime in (I know some people think being a baker is easy, but the shifts are long, you’re on your feet for 8+hrs a day, and it’s a lot of physical lifting and balancing lots of things going on at the same time) – so I would imagine working in a cheese shop has the same difficulties; being on your feet for long periods of time, lifting big blocks of cheese, cleaning the refrigeration (no one wants to see a grimy cheese shop! ), cutting large blocks of cheese manually, etc. And many cheese shops close for a few hours mid-afternoon, so the staff may start work at 9am, take a break from 1:30 to 4pm, then work until 8pm…then clean up! You can certainly find good artisan cheeses in the US; it’s just that French people eat cheese as a matter of course whereas it’s not part of American culture to eat cheese regularly. But Cowgirl Creamery, Maytag, Vermont Butter & Cheese, Rogue, Kendall, Cypress Grove, Grafton Village, Sonoma Cheese, and Laura Chenel (and others) all make excellent cheeses in the US, and are worth seeking out. We were in Paris for a couple of weeks over Christmas several years ago and frequented a great cheese shop in rue Montorgueil (I can’t remember it’s name). After witnessing several french shoppers purchase obscenely small quantities of cheese we realized there were no ‘minimum’s and they seemed happy to fulfill an order with several different kinds of cheese, all in small quantities. Pascal Beillevaire and Beillevaire are Nantais (actually Machecoul) and we’ve been eating his fabulous cheeses since we moved here. How he took his father’s milk business and turned it into a fabulous ode to the cheeses of France is incredible. 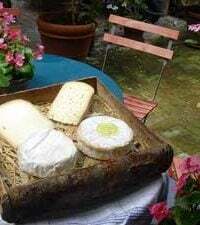 And one can visit the fromager in Machecoul (my husband did). The cheeses are more expensive than other fromagers but oh so worth it. Quite a selection of the best France has to offer. 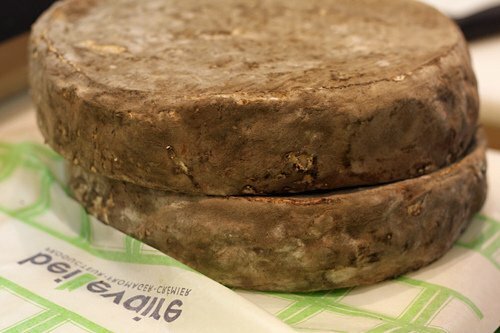 Fabulous comté and I love their own Machecoul… and I agree with you about Saint-Nectaire – my husband loves it while I find it less than thrilling. Yes, it is a family business for the most part. 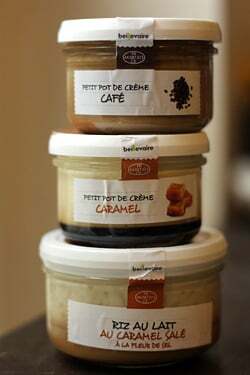 A few years ago they updated things and added new products, like the rice pudding (so good!) – but the selection of cheeses are always interesting. Hmmmm. Love cheese. Love French cheese. Completely off this subject — did I miss a post about your new kitchen/apartment? I hope not! intrigued – I did a week long internship at Laurent Dubois in the 15th and can confirm that working in a Fromagerie is very hard work. For one thing, the day is long. The hours were 8:30am to 1pm and then 4pm-8pm. The 3 hour break in the middle of the day was nice, but if you don’t live in the immediate neighborhood and can’t go home for lunch, it is a long time to fill. On Saturdays the hours were 8am-8pm, with only a 30 minute break for lunch, and there was a line of people out the door the entire day. Thus, you are on your feet constantly. There are no coffee (cigarette) breaks like you would get in an office. Also, because I was there in the winter, the inside of the shop was about 45 degrees F. I wore so many layers I felt like the Michelin man! :) Obviously that wouldn’t be the case in the summertime, but they do try to keep it cool for the cheese. 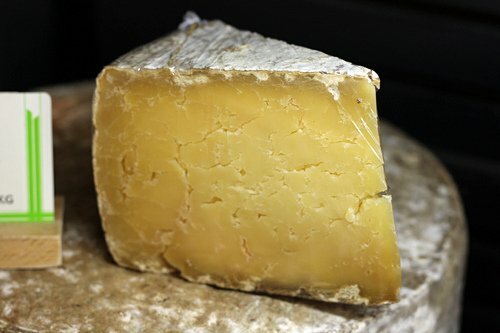 david – this is a fabulous post and your photos of the cheese are amazing. I remember tasting Menez Hom and another one of his cheeses, Machecoulais Crémeux, several years ago. Delicious! Thanks for adding to that discussion. Since you’ve had first-hand experience, you know how hard that job is. Next time I go, I am going to pick up one of those Breton cheeses. They’re rarely seen. I believe you meant to say “holy sh*t batman”. entertaining as always! Wow… what a love letter. delightful. merci. When so many are saying they must use machines for everything or face ruin, the French have been happily making a fortune from making food the right way. I love this post! I think most of the people who make cheese and other things the right way, aren’t necessarily making a fortune – although I’m sure they wish they were (!) because it’s a lot more work. But the people I’ve visited and met who make cheese, wine, bread – and other things by hand – usually do it because either they grew up making it, in that region, or do it as a passion. A few likely break out and perhaps manage to do well financially, but for most, they do it because they’re just passionate about what they do. It’s always a pleasure to meet those people and see them thriving! ah, french cheese. i fell in love with it when i lived in france as a teenager. when i see these pictures i can almost smell it. they’re lovely. by coincidence we bought a st. nectaire in the marché at Lavardac two days ago. it has truly a compelling and strange combination of attributes. 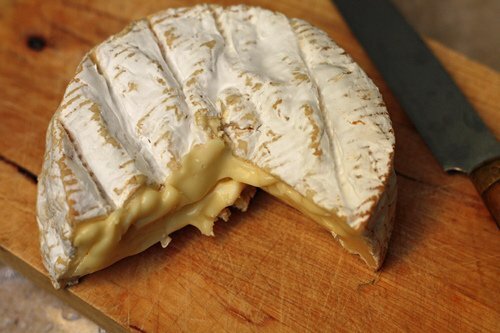 it has an alluring and distinctive flavour profile (though at first subtle, it emerges over time as you eat it), it has somewhat the apearance of a soft brie (bulging centre) but nothing at all of the texture. i think its oddness forces you to confront your expectations…and then rewards you in the end by completely surprising you. My fromagerie is the PB on Fbg St-Martin, and everytime I go it’s an experience. I too am learning about all the different types of cheese here in France and more notably their seasonality. The staff is always super friendly, helpful and generally warm. I never leave without a couple crèmes dessert either. They’re the perfect treat after a weeknight dinner. In a month, my wife and I and friends will be walking the streets of Paris and wandering into the fromageries you mentioned. The wines of France, the cheeses, the butters, the breads the pastries the candies oooohhh. I have not yet arrived in Paris and I already don’t want to leave to come back home. Cheese is so variable it is hard to give more than guidelines. The season, the individual producer, the affineur the temperature it is stored at ….. Plus there are hundreds of possibilities. So trust your tastebuds and get to know your supplier. A variety you like from one shop may be completely when bought somewhere else. A friend who lives near Le Puy, delights in giving us squimish brits cheese with red mites in. It is actually rather good. Fortunately, the mites are tiny, unlike the maggots in that Spanish offering. 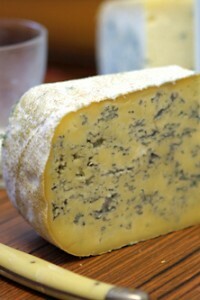 I also enjoy living with 20 miles of one of six AOC Stilton producers, Websters. They are a treat! They will fetch out various cheeses so you can buy the one you like best. Yumm. You are so lucky – to live in Paris AND know what a treasure the cheeses are. 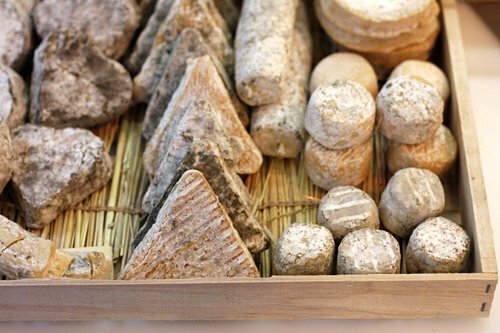 Not much, no — nothing is better than the cheeses of France. Thanks for this post. Hi David – I just wanted to let you know that while Gouda with Nettles may not be common in Paris, it is quite common in Nova Scotia due to several local cheesemakers getting in on the same delicious idea. I’m not sure if it’s due to any particular culture’s tradition, or because nettles literally grow on the roadside here, but it’s one of my favourite cheeses along with a local feta made from sheep’s milk. Yum yum! Very informative post! Looks like cheese heaven. Love it. I think your readers should be aware that most french people are familiar with an average of three/four cheeses (and not many more wines). I am sure you will agree with that. I was one of them , until rediscovering my country and culture through the foreign eyes of my students. Because AOP cheeses and wines are the ultimate terroir products, they are totally regional. So most of us eat the cheeses from where our family is from (sometimes from a part of the country poor in cheese production) plus of course Comté, and Camembert, ubiquitous since Ridel invented the woodchips box, and Mr Lepetit supplied the french army. Brie is an alternative, Roquefort is known to everyone but not necessarily appreciated by all. For decades, the two cheese served at the family table were : Coulommiers because like Romain we had a country home near that town, and Comté because the grandfather was from Franche Comté. I had to learn and discover many other cheeses when I understood how fascinating they are to foreigners coming to my classes and now to me. As for preferences, it is really a question of palate. To illustrate the Saint Nectaire question, my friend Sophie, with family roots in Auvergne, serves it at each dinner party, when in full season. 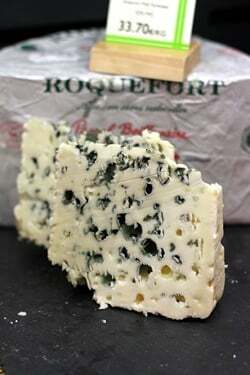 In Aveyron, I met a six year old who ate Roquefort, no french child from any other region would do that. French children, when they eat cheese, usually stick to Caprice des Dieux (no comment!) And I discovered Epoisses through an american. Over decades of dinner parties, I have never never once been served Epoisses on a cheese plater. The marketing of this cheese in America is a mystery to me. 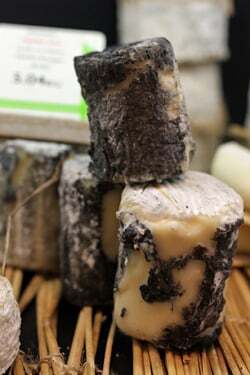 You explain very well the importance of aging, and the hard work and careful attention required to be a good fromager. Last, thank you for pointing out that money is not the object, though we all need to pay our bills. I’m still deciding whether this post is fantastic or absolutely cruel. Either way though, I definitely enjoyed it. I’m panting. Thanks for the experience. Rocamadour — I must have it! This is definitely not the post to read, and especially to look at, when glancing at one’s watch wondering if it’s finally time to get dinner started! @ Maureen: because of the cost of the stock and the need to have the cheese at exactly the right stage, I’ve heard that the best way to make a small fortune from a fromagerie is to start with a large one. It truly is a labour of love. Re the doubtful edibility of the smoked Tomme rind: it reminds me of a visit I made in New York last year to one of the few pizzerias left with a coal-fired oven. I looked doubtfully at the coal dust on the bottom of the slice, but what the hey. It didn’t kill me – and it was delicious. Gavrielle: I know people who eat the hard rind of Comté, and in Italy, people grill the rinds of Parmesan and eat them (or use them in stock) but I’ve also seen some French people scrape away what I think is perfectly edible rind on Brie de Meaux, which obviously isn’t to their taste, which I always eat – so yes, it’s certainly just a matter of personal taste. Paule: When you think about how much milk, and work, goes into making a wedge of cheese, it’s definitely a labor of love. Some cheeses do cost quite a bit more than others – and curiously, the supermarket cheeses often aren’t that much cheaper than the much better cheeses at the fromageries – but there are few things better than great cheese so it’s often worth the few extra euros. Sarah: Nice to know that nettles are used elsewhere. I don’t see them in markets here, but have seen them growing in the countryside. Nick: I recently ate in a three-star restaurant in Paris and Stilton was one of the few cheeses offered with the cheeses course. It’s a great cheese and I’m glad it gets recognition in France. Perfectly written, definitely an appetizer. But above all, HEAVEN for someone like me, who WORSHIP CHEESE! There’s not a single day gonne by, without at least a slice of fine cheese! dear David, I follow your activities with great pleasure and also bought your book ( my sweet life in Paris). in your last blog, you release a good news about a new self-refrigerated ice cream maker by Cuisinart. I have a Demarle ice cream maker but it is not self-refrigerated. I have to freeze the containers before. it is quite bulky. Wanted to buy the Magimix one but it is nearly 600€ so it is still on my wishing list. I was thrilled to see your Cuisinart advert until I realized it doesn’t exist in France yet or does it ? if yes, where and how much ? How does it compare to the Magimix one ? second question : I know you are very busy but as a Parisian foodie, is it possible to meet you ? I am French, have lived in the US and still maintain strong relationships with the English speaking world ; and love cross-culture comparisons, and your sense of humor. I loved your description of your apartment with cookies and ice-cream everywhere; your experiences and the way you donated your “discoveries” and recipes for people to enjoy and taste. I am looking for a new apartment myself and I am concerned about the space I can afford and how big will be the kitchen space. having your insight views would be much appreciated. thanks a lot , just for reading this. I have not tried to new Cuisinart ICE-100 machine, but I own the previous model and like it a lot. For some reason, they’re not available in France so I had mine shipped from England and use an adapter. (When using foreign appliances, always check with the manufacturer first because the voltage may be different.) I had the Magimix in the US, but I found it a little awkward to use. Unfortunately I’m not a real estate expert but I do recommend the services of Paris Property Group, if looking to purchase property in Paris. @David: Sorry, yes, I definitely didn’t mean to imply you were wimpy for not wanting to eat the Tomme rind! I just thought it was amusing that there are two coal-smudged comestibles in the world (my guess would have been none). Had I been able to peel my pizza slice I would have:). I’ve never wanted so badly to jump into a blog post as I do right now. This cheese shop looks like my very definition of heaven. Beautiful. 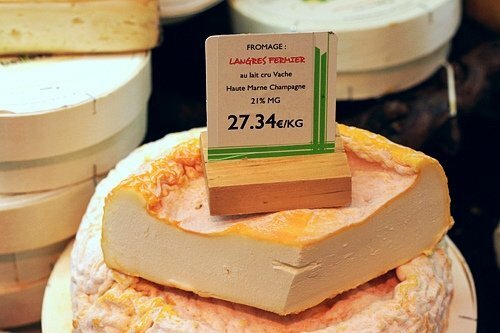 Do you have a glossary of French terms that would be useful at a fromagerie, for those of us without fluency in the language? What a wonderful piece about the glories of French cheese. I live in China where good cheese is practically unknown. But recently I met an extraordinary young man who is making cheese in Beijing. I wrote a blog post about him, which may be of interest. I’ve been reading your blog for awhile now and really enjoy it. We have had the opportunity to visit France, including Paris a few times over the last few years and we love it. I actually just wanted to ask you a question. I’m interested in finding out about cheese schools (and/or cheese making apprenticeships if there is such a thing) in France, particularly for soft cheeses from goats and sheep. Do you have any suggestions about how to best go about this? The Internet is endless and I thought perhaps you might have some suggestions on how to approach this or knowledge on particular schools that you have heard of from your interactions and friendships from people in the cheese industry in France. Any help you can give would be so appreciated! I don’t know of any cheese “schools” or coursework to learn about cheese in France. I imagine that most people learn the trade by hands-on experience. You might want to check out my post, Finding an Internship in France for some ideas on how to get experience. And another is going to the Salon du Fromage, and talking to the folks there (although it’s mostly for professionals, so am not sure how receptive folks would be.) Much would also depend on your fluency in French, too. Lastly, although France has amazing cheeses, there are great cheese producers around the world – including the USA – and perhaps there is one in your area that would allow you to come and apprentice with them. Good luck!